A mall Santa Claus in Sanford, Florida who put Hillary Clinton on the “naughty” list was sent for re-education and shipped off to another mall. 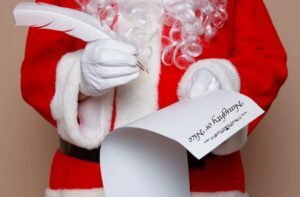 The Santa jokingly said to two children at Seminole Towne Center: “Do you know who is on my naughty list? Hillary Clinton,” CBS Orlando affiliate WKMG reported. An angry parent complained to mall management and posted the incident to Facebook, where the story went viral. “The Santa mentioned in recent reports in Florida is still employed by us, in a different location,” said a statement from The Noerr Programs, the company that runs the mall’s Santa Claus displays.